There were 2,407 auctions held across the combined capital cities this week, with a preliminary auction clearance rate of 69.6 per cent. Last week, the final clearance rate fell to 67.8 per cent, recording the lowest clearance rate year to date, across 1,279 capital city auctions. This is the 3rd week in a row now where the combined capital city clearance rate has trended below 70 per cent. At the same time last year, auction volumes were lower than this week, with 2,183 properties taken to auction and a clearance rate of 67.4 per cent. Across Sydney, preliminary results show an improvement in the rate of clearance after last week’s final result saw the clearance rate drop below 70 per cent, however as more results are collected it’s likely Sydney’s final clearance rate will again slip below the 70 per cent mark. Melbourne’s auction results have also moderated, however the clearance rates remain well above 70 per cent, indicating some resilience in selling conditions relative to Sydney. In Melbourne, Australia’s largest auction market, a preliminary auction clearance rate of 72.2 per cent was recorded across 1,121 auctions this week. Last week, Melbourne’s final clearance rate was recorded at 75.9 per cent across 389 auctions, while this time last year, 1,085 properties were taken to auction across Melbourne and a clearance rate of 68.3 per cent was recorded. The busiest Melbourne sub-regions this week were Melbourne’s Inner region and the Inner South region, where 224 and 160 auctions were held respectively. Sydney’s preliminary auction clearance rate was 72.4 per cent this week. Last week, Sydney’s final clearance rate fell below 70 per cent (67.7 per cent) recording the lowest clearance rate since April 2016, while one year ago results show that 73.4 per cent of Sydney homes taken to auction were successful. In terms of the number of auctions across the city, this week volumes were higher, up to 906 from 619 last week. One year ago 768 Sydney homes were taken to auction over the week. The Eastern Suburbs sub-region of Sydney has shown the strongest performance so far this week, with 85.0 per cent of the 60 reported results selling. There were 150 Brisbane homes taken to auction this week, with 96 results reported so far. The preliminary clearance rate for the city is 49.0 per cent, down from 52.2 per cent last week and higher than one year ago, when 45.1 per cent of the 120 properties taken to auction were successful. Across the Gold Coast 34 results have been reported so far, with a success rate of 50.0 per cent. Adelaide recorded a clearance rate of 71.8 per cent across 101 auctions this week, up from 68.4 per cent across 66 auctions last week. At the same time last year, 80 homes were taken to auction, with 64.8 per cent recording a successful result. There were 62 Perth auctions this week and so far 13 results have been reported, with 46.2 per cent selling. 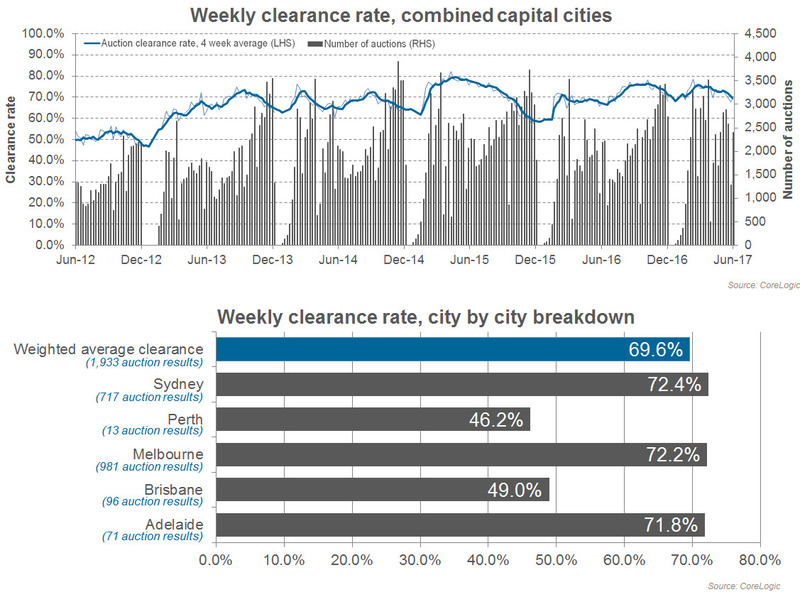 Last week there was a 44.0 per cent clearance rate for Perth. Canberra’s preliminary auction clearance rate of 53.8 per cent this week is lower than last week, when the final auction clearance rate was 62.9 per cent and lower than the 61.0 per cent recorded last year. Tasmania saw 5 auctions take place this week, 3 results have been reported so far, with 2 sales.